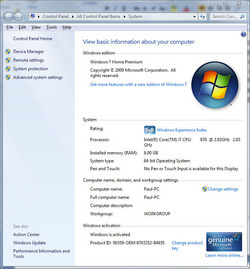 Open the System Properties dialog window which displays your RAM etc. Hold the windows key and press break. For those of you with a netbook with a 800 x 600 max resolution, try the following instructions .... It worked for me on an my ACER Aspire. You can still use 800 x 600, this "hack" just adds 1024 x 768 and 1152 x 864 to your resolution options. You may want to change the text size to 125% as it does become quite small. Keep in mind that while this registry hack has been shown to work with a number of netbooks from different manufacturers, it might not work with all netbooks, and modifying your registry is always something you do at your own risk. It's always a good idea to backup your registry before making any changes by going to the file menu and exporting it. 1) Go to the Start menu and type in regedit in the search box, then hit Enter. 2) Scroll up on the left pane to make sure you are at the very top of the tree. 3) At the top menu, go to Edit then Find... and search for "Display1_DownScalingSupported"
4) Change each instance you find (you'll likely find 2 results for this) from "0" to "1". Make sure you change every found instance, because otherwise the hack won't work (in my experience). Press F3 or select "edit" "Search Next" to find the next item, and change it. Continue until you find that they all contain a "1"
When I am on the internet using my browser the text is sometimes too small. Can I make it bigger? Hold down the "Ctrl" key and use you mouse scroll wheel, up or down, to increase or decrease the text size. If you do not have a scroll wheel use the "-" and "+" key on the number pad or on the keyboard top row ... again, while holding down the "Ctrl" key.